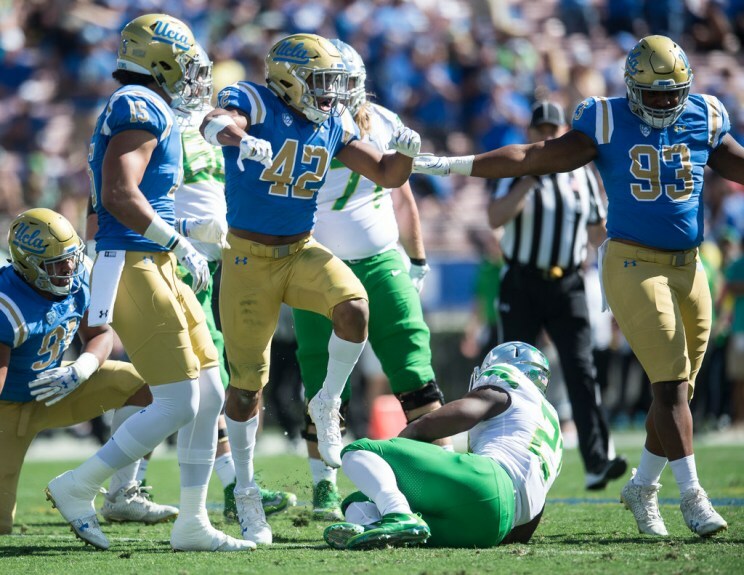 Hours after Josh Rosen declared for the NFL draft, UCLA’s leading receiver joined the quarterback as redshirt junior Jordan Lasley announced his intention to forgo his senior year Wednesday night. The Gardena Serra grad led the Bruins with 1,264 receiving yards and 69 catches in just nine games, missing four games due to suspensions. His 140.4 receiving yards per game set a UCLA record over a season and would have led the country, but he was not eligible for the national leaderboard because he didn’t play in 75 percent of his team’s games. Receiver Jordan Lasley talks about watching Chip Kelly‘s old Oregon teams, the potential decision he faces about the NFL and being named UCLA’s offensive MVP. Receiver Jordan Lasley talks about why he participated in the senior night celebrations even though he’s a redshirt junior, getting to a bowl game and his relationship with Jim Mora. Receiver Jordan Lasley talks about returning from a three-game suspension, what he did to help earn his way back on the field and what it felt like to get back.